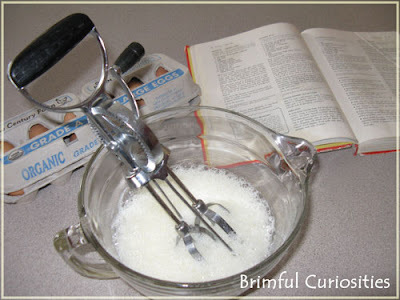 One of my favorite kitchen utensils - my vintage ECKO Best Hand Mixer. Both my grandmother and mom own one as well. We use ours often to beat up a batch of pancakes. Notice the Betty Crocker cookbook in the background? That's vintage, too! My Grandmother used to have one of those and when I cleaned out her house I looked and looked for it, to never find it. I too have a vintage Betty Crocker cookbook, 4 to be exact. Aren't they the best. Sometimes I just love doing it "The old fashioned way" rather than speeding everything else, ease it down - more slowly. Please. I think my mom has one of those. They do work well, especially for beating eggs and making instant pudding. Have a wonderful Wednesday! That's impressive! The hand mixer has always intimidated me a little. I also have a vintage Betty Crocker cookbook! I seriously need one. I lost my electric one and this one would be WAY easier for me to keep up with! Sometimes the old ways are really the best ways. You rock that hand mixer, Girl! My wife says she prefers mixing with her hand turn mixer. I think she just likes licking the mixer (but so do I). Following you, stop by me if you have time. I'll be back to look around. I remember these! Never mind that I really love all things vintage but I love them for my preschool classroom and cooking projects! I also use them to teach kids how gears work. I've only seen these online. Before handmixers. We'd have to use a spoon to do our batter. Tedious I tell ya!